Beer pong game is one of the ultimate drinking sports around. A great party drinking game where everyone can get into teams and cheer each other on. See our collection of cool looking Beer Pong Tables. Materials: 20 plastics cups, 2 or more ping pong balls, Lots of beer! Object: To sink the ping pong ball into your opponent’s plastics cups to get them to drink. On a long table (ping pong table), line up 6 plastic cups in the form of a triangle in front of each team at each either end like in bowling. Next, fill each cup about half way with beer. Pick your teams, and get into position. 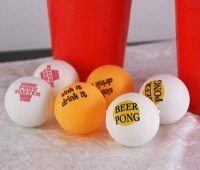 Each player should have a ping pong ball. Flip a coin to decide which team goes first. Each player on the team gets a ball and throws one after the other. So if Team A starts, each player gets to throw / toss/ or bounce the ball and try to get it to land in the other team’s cups. Team B is allowed to try and blow the ball away (be careful, however, as you may blow the ball right into the cup) or to swat it – as long as its bounced once. If the ball hasn’t bounced, no one can touch it. If a ball goes in the cup, someone on the team must drink it. Whoever is going to drink the cup needs to grab it as soon as they can because another player on the opposing team is going to shoot again – trying to get two balls in the same cup (the goal of the game). If this happens, the losing team must drink all the cups on the table all at once. So, each player on each team take turns, one after another, until everyone on that team has shot. Once everyone has gone, the other team gets all the balls and each player gets their turn. If a ball is sunk, the glass must be drunk immediately and refilled. The game is fast-paced and no one waits for anyone. Players just keep going. Check out our other Drinking Games like Jenga Drinking Game, Ring of Fire, Century Club, Hatmen Dice Game, Pass the Pitcher, The Pot or Waterfall, King’s. Or our Movie Drinking Games and Music Drinking Games.